Of all the world's alluring destinations for the birding traveller, Israel in Spring must top most lists. The Rift Valley provides a thoroughfare for countless species of migratory birds, with the bottle-neck geography funnelling their flight passage over this restricted area. Naturalist Malcolm Rymer visits with birding friends and the resulting two videos capture over 130 species of birds as well as the varied landscapes and associated beautiful flora and fauna. 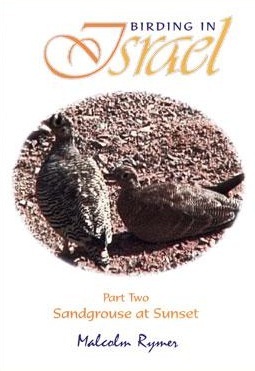 From bases at Kibbutz Lotan in the Arava Valley of Southern Israel and Kibbutz Gvulot in the North Western Negev Desert, this film, 'Sandgrouse at Sunset' charts and explores the key sites. The companion DVD 'Bluethroats before Breakfast' offers an extended journey around the south of this amazing country.